Lightly grease a 20cm diameter springform tin and line the base with baking paper. Preheat the oven to warm 160 degrees celcius. Finely crush the biscuits in a food processor and mix in the butter. Spoon into the tin and press firmly into the base and side of the tin. Chill for 30 minutes. Using electric beaters, beat the cream cheese, sugar, lime rind and juice until creamy. Gradually beat in the eggs and passionfruit pulp. Pour into the tin, put on a baking tray to catch any drips, and bake for 45-50 minutes, or until just set. To make the topping combine thesugar, cornflour and 2 tablespoons water in a small pan over low heat. Stir until smooth, add 2 more tablespoons water and the passionfruit pulp and stir until the miture boils and thickens. Pour the hot topping over the cooled cheesecake, spread evenly and cool completely. Refrigerate overnight. Can be served with piped cream. 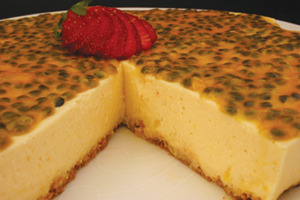 Note: You will need to use the pulp of approximately 8 passionfruit for this recipe.